The oldest surviving example of Greek architecture in Sorrento is Porta Marina Grande, usually known as the Greek Gate, which has hardly changed since it was built there by the Greeks when they ruled Sorrento in the fourth century BC. Originally, the gate would have been under a tower and when it was built it probably provided the only access to the city from the sea. Together with a gate built later at Marina Piccola, which no longer stands, it would have been the only outlet for trade with neighbouring cities before the Roman era. 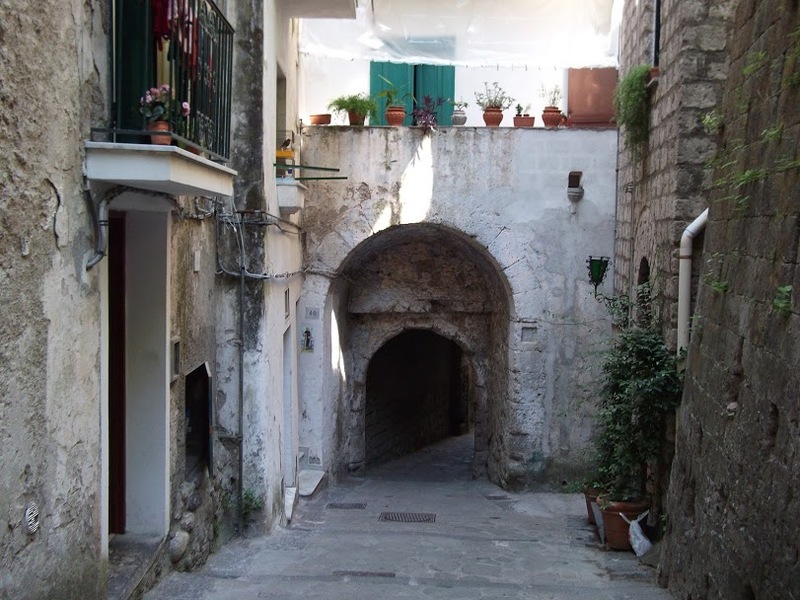 The Greek Gate was incorporated into the 16th century walls built to protect Sorrento from pirates but, sadly, it was the way by which Turkish pirates entered the city on 13 June 1558 when, according to legend, the gate was opened to them by a slave working for the Correale family. The gate was built in regular rows of blocks of stones and has two archways. You enter through the first and exit through the second archway to walk down the steps into Marina Grande. Somewhat confusingly, it is Marina Piccola - the 'small' marina - where large boats dock and hydrofoils from Naples, Ischia, Capri, Positano and Amalfi arrive and depart. Marina Grande - the 'big' marina - has the feel of a small fishing village that has remained unspoilt over the years and is well worth a visit as there are plenty of restaurants that serve fresh fish. You may even see fishermen among them mending their nets as fishing by traditional methods is still an important part of Sorrento ’s economy. 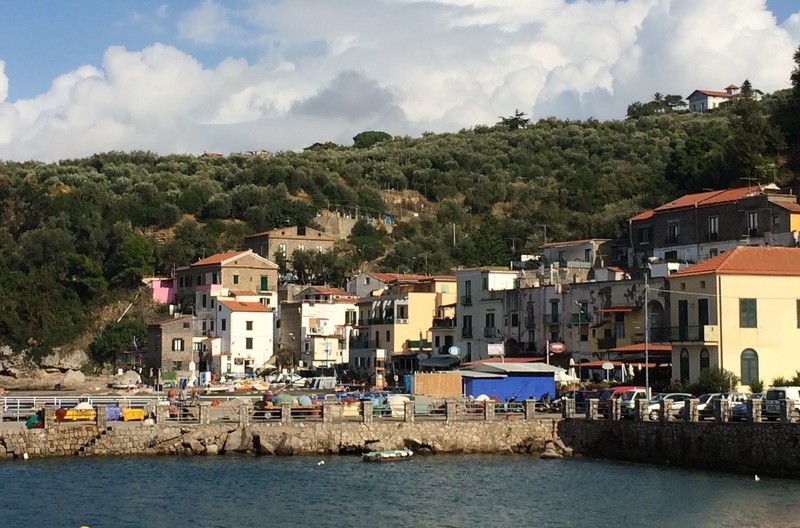 There are also a few shops, bars and restaurants at Marina Grande but, despite receiving many visitors, there is a homely atmosphere where everyone knows everyone else because the same families have lived there for generations. The pretty, seaside village of Marina della Lobra, with its stretch of sandy beach that is rare for the area, is a lovely place to visit. 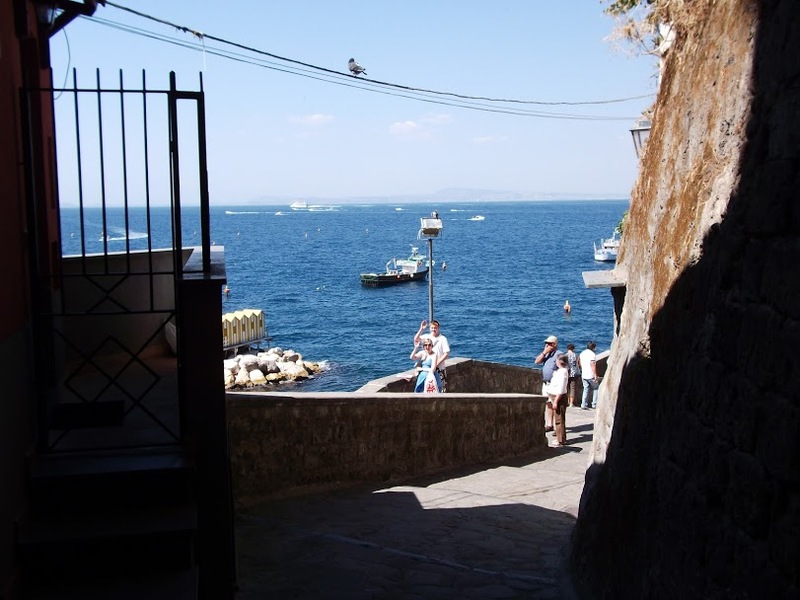 From the town of Massa Lubrense, which is further out along the peninsula from Sorrento, you can walk down to the seafront along a winding road. When you reach Marina della Lobra, there are restaurants and bars, a beach that is free to the public and places where you can hire boats. 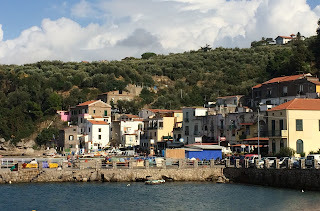 Now a fishing village, Marina della Lobra used to be a small port that was popular as a summer residence for wealthy Romans. Marco Vipsanio, the son in law of Emperor Augusto, is said to have built his villa here. During the summer, you can take a boat trip from the harbour to explore the coastline and get a closer view of Capri and the Amalfi coast. Or, you can escape the crowds and enjoy a relaxing swim in the sea. The most important monument is the church dedicated to Santa Maria della Lobra, which dates back to the 16th century, when it was built over the ruins of a former Roman temple. The church organ is supported by two ancient columns that may have been salvaged from the original temple and the church still has a 17th century wood carved ceiling and an 18th century majolica floor. The adjacent 17th century cloister was built when there was a Franciscan convent on the site. A few buses run between Marina della Lobra and Massa Lubrense, so check the timetable if you would prefer to ride back up the hill rather than walk. The local Linea A (Line A) buses operated by EAVBUS run all the way out to Massa Lubrense from Sorrento during the summer. The SITA coaches that connect Sorrento with resorts such as Positano and Amalfi further along the coast call at Massa Lubrense all the year round. 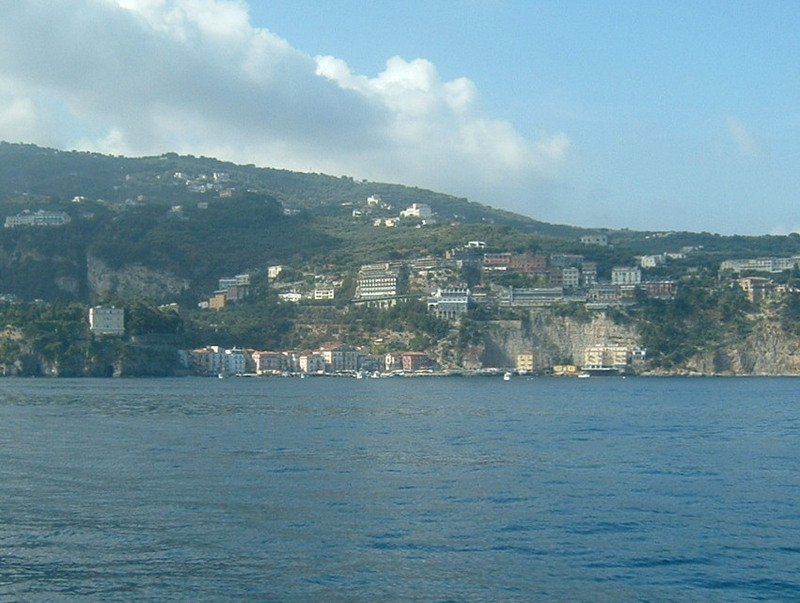 The journey from Sorrento to Massa Lubrense’s main square takes about 15 minutes. 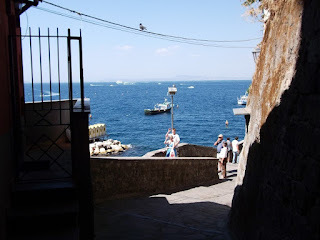 Sorrento had defensive walls built to protect it as long ago as the Greek era, centuries before the birth of Christ. When the resort became part of the Roman Republic the walls were added to and improved and the Romans built over the original Greek town following the same layout. During the Roman period, Sorrento was completely surrounded by walls, with five entrance gates, to protect the town from the sea and from invaders from inland. A series of towers were built to defend the gates and these continued to protect Sorrento in the middle ages. When invaders were sighted sentinels would sound the alarm and local people would leave whatever they were doing in order to escape. In the 16th century, after a catastrophic invasion of the town by Turkish pirates, the walls were rebuilt to provide a more robust line of defence for the local people. But it is now possible to see remains of the ancient Greek walls below street level at Porta Parsano Nuova, where they have been exposed and put on public display. There is free admission to the site, which can be accessed from Via Antonino Sersale, a left turn off Via degli Aranci that leads to Corso Italia. During the excavations, pottery, fragments of mosaics, glass, bones and iron objects were found, proving that the original Greek gate had once been filled in and bricked up. It was reopened and widened in the 18th century to form the present Porta Parsano Nuova. This was the beginning of a redesign for the centre of Sorrento, which led to the widening of Corso Italia and the creation of Piazza Tasso. It was made bigger than the previous main square, Piazza Castello, which had been named after a castle that no longer exists. The opening of the Bastion of Parsano to the public has been seen as an important step by the local authority towards promoting Sorrento’s many other historical sites and monuments. The site is open from 10 am to 1 pm and during the height of the summer is also open in the evenings from 7 pm to 10pm. Miraculously, the Greek Gate in Via Marina Grande, which you pass through to get down to the seafront, is still in fine condition even though it was erected as long ago as the fourth century BC. Sorrento is today celebrating the feast day of one of their patron saints, San Baccolo. The saint, who is venerated as a former Bishop of Sorrento, died on August 27, which became his feast day in the Catholic calendar. 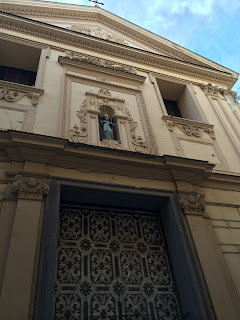 His remains were initially buried in one of the city’s ancient walls, but they were later moved to the Church of Santi Felice e Baccolo in Sorrento, now known as the Church of the Rosario. A book written about the life of Sant’Antonino, the most important patron saint of Sorrento, refers to other saints of Sorrento, such as the bishops Renatus, Athanasius and Baculus, known in Italian as Baccolo. The saints are described from their appearance in a painting by Luca Giordano showing them surrounding the cross while Christ was being crucified. This painting is now in Palazzo Reale in Naples. It is thought Baccolo was Bishop of Sorrento at some time during the seventh century. 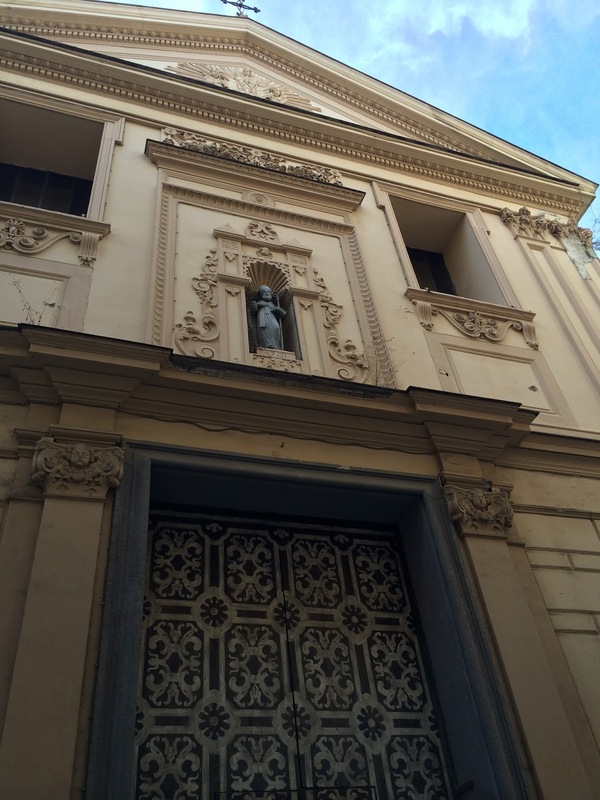 The Church of Santi Felice e Baccolo, known also as the Church of the Rosario, is in the historic centre of Sorrento. Between the 12th and the 15th centuries the church was the Cathedral of Sorrento. It had been built by a Duke of Sorrento to make evil spirits, who seemed to be plaguing the area, disappear. Its origins probably date back to the time of Constantine the Great in the fourth century when a building was constructed over the remains of a pagan temple. The present day church of San Rosario in Via Tasso is considered one of the most beautiful Baroque churches in Sorrento. The Church has one nave and on the high altar is a statue of the Madonna of the Rosary. The Church also has a statue of San Baccolo and beneath the altar there is an urn containing his relics. The singer-songwriter Lucio Dalla was born on this day in 1943 in Bologna. Dalla is most famous for composing the song, Caruso, in 1986, after staying in the suite the great tenor used to occupy overlooking the sea at the Grand Hotel Excelsior Vittoria in Sorrento. The song has been covered by many other artists since, including Luciano Pavarotti and Julio Iglesias. 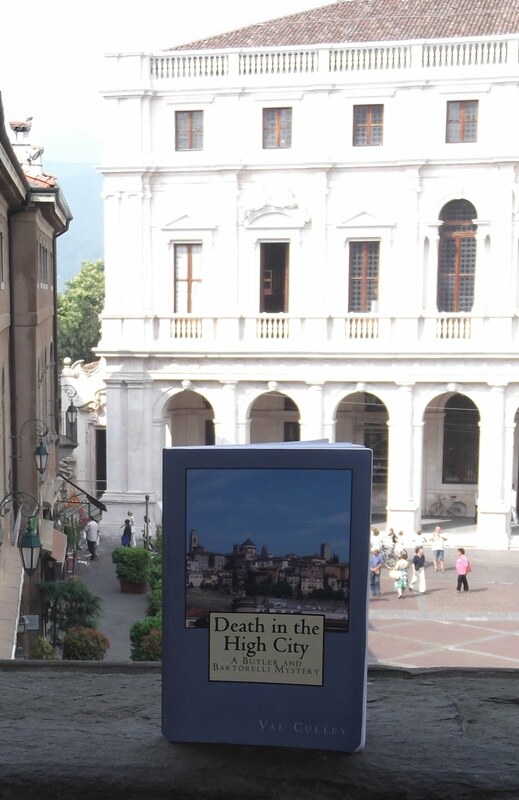 In the book Caruso the Song - Lucio Dalla e Sorrento, Raffaele Lauro, a writer from Sorrento, recalls that Dalla booked the very suite at the Excelsior Vittoria that Caruso had occupied during the final weeks of his life in 1921. While staying there, Dalla composed the song, inspired by his love for Sorrento, his respect for the great tenor and his fondness for classic Neapolitan songs. The Fiorentino family, who owned the Excelsior Vittoria, were later to dedicate a suite to Dalla. Dalla had started playing the clarinet when he was young and joined the Rheno Dixieland Band in Bologna along with the future film director, Pupi Avati. Avati was later to say that his film Ma quando arrivano le ragazze? was inspired by his friendship with Dalla. In the 1960s the band won first prize in the traditional jazz band category at a festival in Antibes. After hearing Dalla’s voice, singer-songwriter Gino Paoli suggested he try for a solo career as a soul singer, but his first single was a failure. Dalla had a hit with 4 Marzo 1943, originally entitled Gesù Bambino, but the title was changed to the singer’s birth date so as not to cause offence. 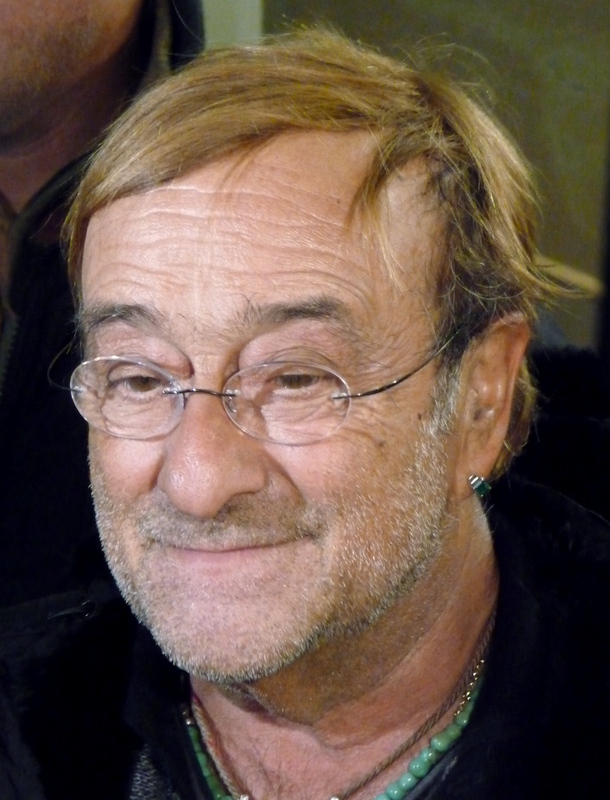 In the 1970s, Dalla started a collaboration with the Bolognese poet Roberto Roversi, who wrote the lyrics for three of his albums. When the association ended, Dalla decided to write the lyrics for his songs himself and his subsequent Banana Republic album was a success in 1979. The version of Caruso sung by Pavarotti sold more than nine million copies and Dalla was invited to sing Caruso in a duet with Pavarotti in a 'Pavarotti and Friends' concert in Modena in 1992. Andrea Bocelli included his version of the song on his first international album, Romanza, which sold more than 20 million copies worldwide. 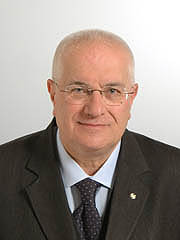 Dalla was made a Commander and subsequently a Grand Officer of the Order of Merit of the Italian Republic and was awarded an honorary degree by the University of Bologna. 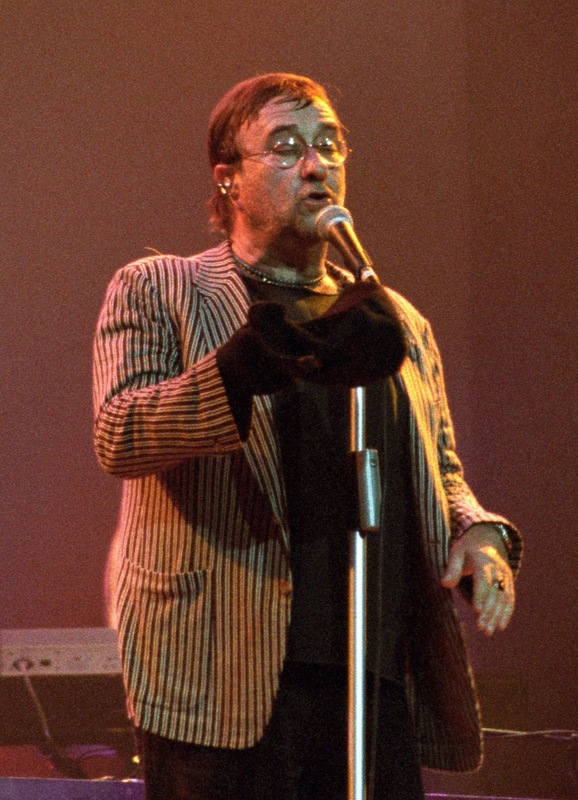 The singer songwriter died three days before his 69th birthday in 2012, after suffering a heart attack in a hotel in Montreux in Switzerland, where he had been performing the night before. About 50,000 people attended his funeral in Bologna and his hit song, Caruso, entered the Italian singles chart after his death, peaking at number two for two consecutive weeks.The single was also certified platinum by the Federation of the Italian Music Industry. The Grand Hotel Excelsior Vittoria is a familiar landmark as you approach Sorrento by sea. 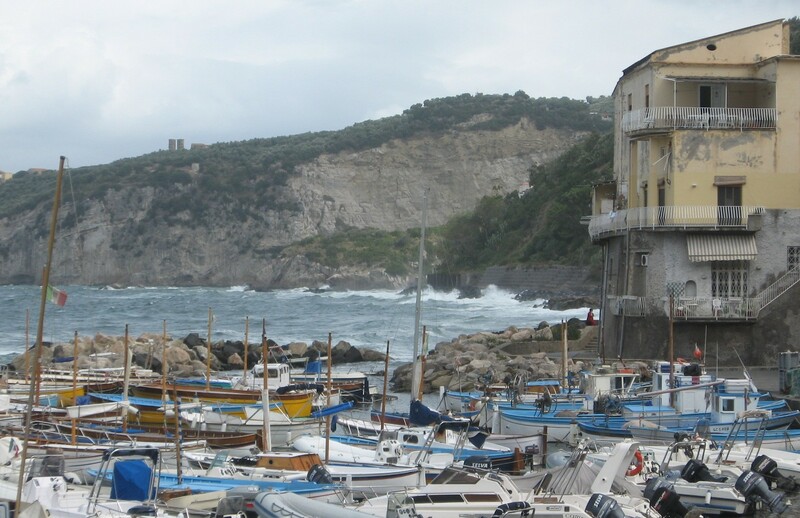 You will see the three 19th century hotel buildings high on the cliff above the port of Marina Piccola when you arrive by boat from Naples or the islands. 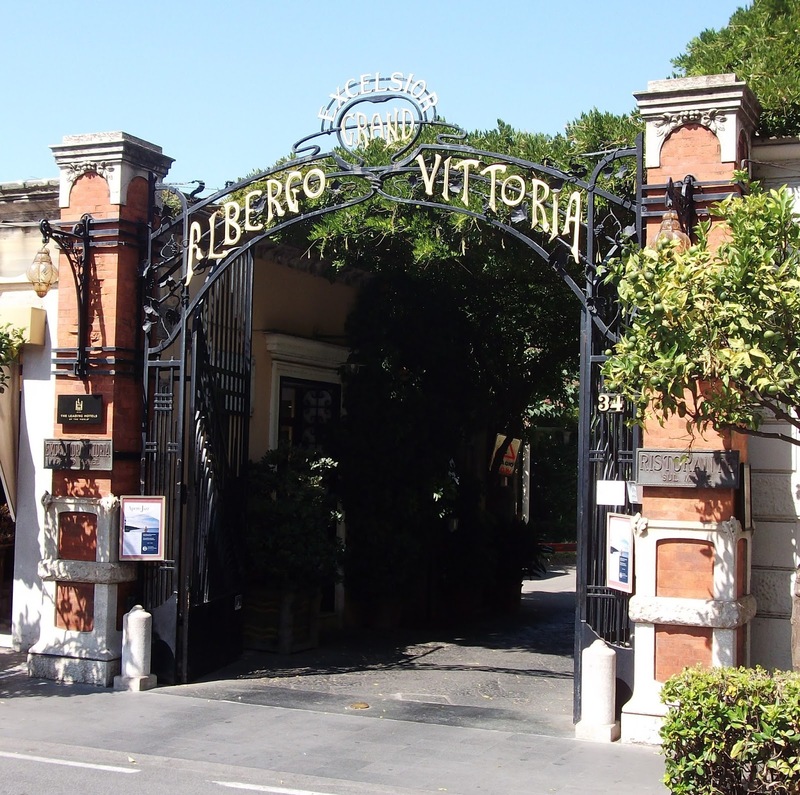 The Excelsior Vittoria is probably Sorrento ’s most famous hotel and it has now achieved global recognition as part of the Leading Hotels of the World group. 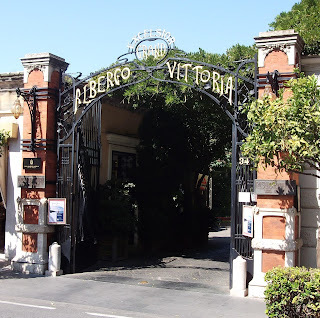 From the imposing wrought-iron entrance gates in Piazza Tasso, a long driveway lined with orange trees leads to the entrance and reception area. 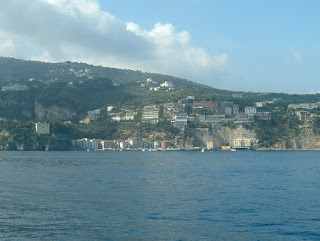 At the back of the hotel, the terrace has panoramic views over the bay of Naples and of Vesuvius across the water. Tenor Enrico Caruso was famously photographed in front of those views during his final stay in 1921. The Excelsior Vittoria had been opened as a hotel by the Fiorentino family in 1834 and is still, to this day, run by their descendants.